The widow of a hugely respected Pendle man who died days before being honoured in the Queen’s birthday list collected his award in an emotional ceremony at Lancaster Castle. Stephen Maden, a founder member of Pendle Voice Talking Newspaper, died suddenly at home in June, just days before he was named in the Queen’s Honours List in receiving a British Empire Medal. His heartbroken widow Maxine fought back tears when she collected the BEM on behalf of her devoted husband from the Lord Lieutenant of Lancashire, Lord Shuttleworth. Maxine said: “It was very difficult and emotional collecting the award for Steve to be honest, but I felt it ought to be presented in person rather than through the post. “Thankfully, Steve knew about his award because he was notified by letter just days before he died. The last few months have been absolutely awful. Together with wife Maxine, Stephen delivered audio cassettes of local news on motorbike around the borough to blind and partially sighted people. After attending Edge End High School in Nelson, Steve joined the RAF at 16 and served in an administrative role for 13 years before joining the teaching profession. 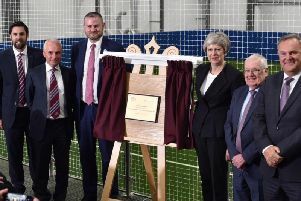 His new calling saw him work as a PE and maths teacher at Haslingden High School until he took early retirement aged 55. The role allowed him to exercise another of his great passions, hill walking, taking children on many school trips to the south of France and the Lake District. A long-time member of Burnley Mountaineering Club, and most recently president, Steve once took two blind people to the top of Ben Nevis and also once met legendary Lakes writer Alfred Wainwright.